Seventeen years after her initial conception as a top-notch luxury tugboat, Lars has been launched as a customised 36.4 metre polar-exploration superyacht. It is perhaps the ultimate investment in pleasure to build a yacht with one specific six-month trip in mind. After returning from an extensive tour of the world’s warmer climates on his previous custom yacht, the owner of the 33 metre Baloo (launched by CBI Navi in 2004) set a new goal of exploring the North Pole region. Like his first yacht, Lars is named after a character (the Little Polar Bear) from an animated film for children, but there the similarities end. 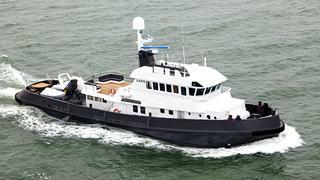 This little bear is an Ice Class expedition yacht designed to handle the harshest conditions. The story of Lars dates back to 1995 when she was conceived by a Dutchman as the definitive tugboat for pleasure sailing purposes. Designed by naval architect Herman Janssen, the hull and core superstructure were built to Bureau Veritas and Norwegian Ice Class by Dutch yard Made. Her quality was exceptional, with a rib every 20 centimetres in the forward section and some 40 tonnes of stainless steel in the hull. Unfortunately, the original owner was unable to complete the boat himself as intended, and she remained moored behind his house in pristine condition. Fast forward to the summer of 2010, and the vessel had still never sailed on her own engine. And she never would: the Industrie diesel was removed in an ambitious conversion project by a new owner. This has included raising and restyling the superstructure to give more of a ‘yacht’ feel, especially on the fore section where the additional shaping generates extra space for air-conditioning and the like. The flying bridge has been made more complete, the bridge deck superstructure lengthened to include a lounge area, a new bathing platform integrated into the canoe stern, and the interior completely redesigned. The yard tasked with completing the Lars build in a matter of months was Stemat Marine Services. Based near Rotterdam, Stemat’s credentials of bringing parties together in a limited time-span are excellent, as its everyday business is creating 70 metre offshore vessels in under a year. All the superyacht contractors involved switched their operations accordingly, while the actual extensions were made by Stemat at the nearby Neptune shipyard. It was from here that Lars was launched in early February in blizzard conditions – highly appropriate considering the yacht’s raison d’être. And while the final outfitting was completed at Stemat, a series of sea trials showed that Lars more than met expectations. With so many pedigree people and companies involved in her creation, Lars is still a very comfortable boat, especially in ways that reflect her sailing destination. For instance, while wooden floors are laid throughout as part of a no-nonsense approach to keeping maintenance to a minimum, every inch of the floor is electrically heated. And although the primary emphasis of the walls is to provide sound and fire protection, the system of easily removable oak panels covered in silk-finished wallpaper is certainly pleasing to the eye. Lars also has a first-class treated air-conditioning system to ensure an onboard temperature that renders the outdoor climate irrelevant. 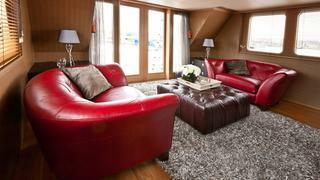 All in all Lars offers a pleasant environment for up to eight guests on long journeys. The owner’s suite is amidships on the lower deck and makes the most of the eight metre beam to include a bath and a large shower. Two of the guest cabins are of similar size, both twins, with removable central bedside tables if queen-sized doubles are preferred. A third cabin can be used for either crew or guests, depending on the configuration of the charter. The main deck lounge and dining area is an informal split-level area where guests and crew can mingle. The galley is to port with a pass-through, and can be closed off, while the forward crew area and wheelhouse can be closed from the guest area aft should this be desired. Not that there is an ‘us and them’ atmosphere on board Lars. On the contrary, the crew quarters and mess are spacious for a yacht under 40 metres, reflecting the extended periods she will spend at sea as well as the vessel’s wide nose. 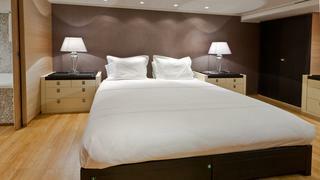 The en-suites are large and the cabins even include double cupboards. There is also a large captain’s cabin strategically placed close to the wheelhouse. For the best vistas guests are likely to head for the bridge deck saloon, whose windows were especially enlarged with this in mind. As the prime indoor social area, its darker oak finish is slightly more luxurious and it has a bar. The large bridge deck aft would be ideal for dining should Lars ever head to warmer areas, and a built-in freezer and seating arrangement are in place. This forward thinking is also seen in the inclusion of cabling on the bridge deck aft should someone later wish to convert Lars into a flying bridge boat. For now, this is very much a vessel designed to facilitate exploration, much of which will take place on shore. 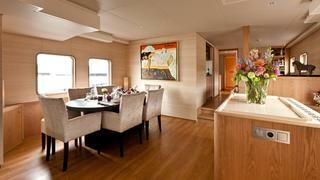 With this in mind the large area aft on the main deck is home to two tenders, one a 7.5 metre, the other a 4.5 metre. These are launched by a Palfinger crane, which, thanks to an 18 metre reach, can also deposit sledges and snowmobiles on the shore.